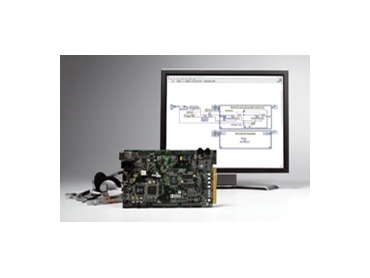 National Instruments and Analog Devices has released of the NI LabVIEW Embedded Module for ADI Blackfin Processors 2.0, an extension of the LabVIEW graphical development environment that directly targets ADI Blackfin processors. LabVIEW Embedded Module for Blackfin Processors has been adopted by engineers for the rapid development of sophisticated embedded systems ranging from cutting edge medical devices to subsea monitoring systems. The new version of the module delivers more than 30 percent increased efficiency in code generation and expanded Blackfin processor support including the ADSP-BF531, which provides a price/performance advantage ideal for cost sensitive applications such as portable test equipment, embedded modems, biometrics and consumer audio. The combination of the LabVIEW graphical development platform and the high performance, low power Blackfin processors delivers an out of the box solution that companies are using to optimise costs and shorten time to market for embedded systems. NAXYS selected the LabVIEW Embedded Module for Blackfin Processors to deploy a high reliability, real time monitoring system 850 m below the ocean surface. The project called for the development of a subsea pipeline monitoring system in the Ormen Lange gas field off the coast of Norway to analyse vibrations that can potentially cause gas leaks or pipeline ruptures. Using LabVIEW and the Blackfin based ZMobile platform from Schmid Engineering, NAXYS created a network of underwater sensors that takes advantage of ultrasonic technology to synchronise multiple modules in real time while also being able to sleep for hours at a time. In addition, the system provides high speed data collection, fast interrupt response and a multithreaded deterministic application. According to NAXYS, the Ormen Lange pipeline monitoring system needed a solution that could operate in harsh conditions for long periods of time, which placed a high demands on software and hardware reliability, in-program error handling and efficient energy management. The combination of LabVIEW and ADI Blackfin processors delivered the stability, versatility, performance and battery life it needed to meet both the time to market and quality requirements. Boston Engineering chose the LabVIEW Embedded Module for Blackfin Processors in conjunction with FlexStack, a Blackfin based off the shelf deployable hardware platform, for the development of an automated intravenous drip infusion pump that required slow flow rates, a fail-safe operation and a simple user interface. Engineers used LabVIEW to design the algorithms on a PC, develop hardware in the loop test system and deploy the final solution to a Blackfin processor. According to Boston Engineering, the use of LabVIEW in all aspects of the design process was critical to its success in getting the IV drip infusion pump completed fast. Boston Engineering was able to take the majority of its embedded code from the design phase all the way to the chip, significantly reducing their engineering costs and, therefore, the final cost of the solution. The LabVIEW Embedded Module for Blackfin Processors 2.0 introduces new features to further simplify and enhance embedded system development. The new version of the module targets four additional Blackfin processors including the ADSP-BF531 processor, which is the low cost processor in the Blackfin family. The module also delivers increased efficiency for embedded system development including an average 36% increase in generated code performance, improved debugging capabilities and integration with LabVIEW 8.20. In addition, the module adds new drivers for Two Wire Interface (TWI) and a CMOS image sensor. As with the previous version, the LabVIEW Embedded Module for Blackfin Processors 2.0 includes more than 140 Blackfin specific, hand optimised math, analysis and signal processing functions; integrated I/O such as audio and video DACs, ADCs and CODECs, and on-chip debugging. The module also includes the fully featured and accessible ADI VisualDSP++ C development and debugging environment for low level access and real-time, interactive debugging and deployment directly to Blackfin.